Although many anticipate that there will be an eventual shortage of practicing nephrologists, a complete understanding is lacking regarding the current factors that lead US adult nephrology fellows to choose nephrology as a career and their satisfaction with this choice. It is of great concern that interest in obtaining nephrology fellowship training continues to decline in the United States, especially among US medical graduates, and the reasons for this are unclear. The exposure that students and residents have to nephrology is likely to play an important role in the career choices that they make and their ultimate satisfaction with this career choice is likely influenced by several factors, including job opportunities. Some of the findings presented here suggest that there may be a high percentage of nephrology fellows who are dissatisfied with their career choice. Failure to understand the factors that influence trainees to choose nephrology as a career and those that affect their satisfaction with this choice may impair the ability to graduate a sufficient number of nephrologists to meet projected demand. In this article, a number of variables related to the choice of nephrology as a career and satisfaction with a career in nephrology are discussed. Some steps that the nephrology training community might take to help promote interest in nephrology and optimize the satisfaction that nephrology graduates derive from their careers are also proposed. Interest in pursuing a career in nephrology continues to decline in the United States, especially among US medical graduates (USMGs) (1,2). This declining interest in nephrology is occurring at a time when the demand for nephrologists seems to be increasing (1,2) and available fellowship positions are increasing as well. Of the 397 available positions for match, only 98 USMGs will enter into nephrology fellowship programs in 2012 (3). Declining interest in nephrology and concern regarding a potential shortage of practicing nephrologists is not unique to the United States and has been reported in other countries as well (4). There are several proposed reasons for this declining interest. They include difficult-to-understand or unstimulating renal pathophysiology courses in medical school; disheartening inpatient experiences; few opportunities to experience the other aspects of nephrology careers like outpatient nephrology clinics, outpatient dialysis, kidney transplantation, and interventional nephrology; and perceived workload of nephrologists (1,5,6). Recognizing the need to increase interest in nephrology careers among US medical trainees, the American Society of Nephrology (ASN) formed a task force (1). In its final report, which was released at the annual ASN meeting in November 2010, the task force made several recommendations to the nephrology community to increase interest in nephrology careers (1). To gain greater insight into fellows’ choice of nephrology as a career and their satisfaction with this, we conducted a national online career choice survey in June of 2011. The survey was deemed exempt by the institutional review board at our institution. This anonymous survey consisted of several career choice selection and satisfaction questions (developed by H.H.S. and K.D.J.) that were distributed to US adult nephrology fellows via US nephrology training program directors in June of 2011. Both graduating nephrology fellows (defined as fellows scheduled to graduate June 30, 2011) and nongraduating nephrology fellows (defined as fellows not scheduled to graduate until at least the following academic year) were surveyed. The survey was closed on June 30, 2011. A total of 204 US adult nephrology fellows (22.9% of the 892 in training in 2010–2011) responded to our survey, with half (n=102) being graduating fellows and the other half being nongraduating fellows. The results showed that 42.7% of graduating fellows and nearly one-third (33.3%) of the nongraduating fellows completed their medical school training in the United States. Nearly three-quarters (74%) of the graduating fellows and 55.4% of nongraduating fellows were either US citizens or green card holders. The other results of this survey are included in our discussion below. When Is Nephrology Chosen as a Career? To better understand the factors that play a role in trainees’ decisions whether to pursue nephrology, it is important to know when such decisions take place. Hence, our survey included questions regarding when fellows had chosen nephrology as a career. We found that nearly one-third (30.3%) of the fellows chose nephrology as a career in the first year of medical residency training (Table 1). For the remaining fellows, an equal percentage chose nephrology as a career in either the second year of medical residency (24.6%) or during medical school (22.6%). A lesser percentage of fellows chose nephrology either during the third year of medical residency (12.8%), after medical residency training (6.6%), or before medical school (3.1%). The majority of fellows who took the survey chose nephrology as a career during the first 2 years of medical residency, mainly in the first year. Parker et al. presented the results of an ASN fellow membership survey in 2009 during the ASN annual meeting (7). They reported that 40.1% of respondents choose nephrology as a career during medical school and 31.3% choose during the first year of medical residency. In contrast, our survey suggests that the majority of fellows seem to choose nephrology during medical residency as opposed to during medical school, suggesting that measures to increase interest in nephrology careers among medical students are needed. It is plausible that as a result of the fellowship matching date moving back by 6 months, more medical residents will select their careers during or by the end of their second year of residency, although this would not likely affect decision making at the student level. Is Nephrology the First Choice for Fellows? Nephrology may or may not have been the initial choice for fellows for a variety of reasons. Although it is hoped that for most nephrologists that it was their first choice, it is plausible that many might have pursued other fellowships as a first choice but were unable to obtain a position in that specialty. It is well known that certain subspecialty fellowships are more difficult to obtain positions in than others. Therefore, another question we asked in our survey was whether nephrology was their first choice. For the majority of fellows, nephrology was their first choice (Table 1). However, our survey results reveal that nephrology was not the first career choice for nearly one of five fellows surveyed. This is potentially of great concern because if this is true of the nephrology community as a whole, this would suggest that approximately one of five nephrologists are practicing in a specialty that was not their first choice. Interestingly, as reported below, 17.3% of respondents chose nephrology because they were either less likely or did not match into the fellowship of their choice. Why Do Fellows Choose Nephrology? Understanding the reasons why nephrology is chosen as a career can help provide insights into how declining interest can be addressed. It is plausible that, as for all medical careers, there are common variables that play a role, including intellectual interest in the field, the presence or lack of a significant procedural component, earning potential, ease of finding practice opportunities, and others. The experiences that students and trainees have are likely to influence them as well, either positively or negatively. To explore this, our survey asked questions regarding why trainees had chosen nephrology as a career. Not surprisingly, the top three reasons for choosing nephrology as a career among fellows included the following: found nephrology interesting during medical school or medical residency (75.8%), excellent mentoring or role model in nephrology during medical school or medical residency (65.2%), and excellent association of general internal medicine with nephrology (49.7%). The other less common reasons to choose nephrology as a career among fellows included the following: found nephrology research interesting during medical school or medical residency (13.1%), was less likely to match into another fellowship of interest (12.6%), excellent income potential after graduation (9.9%), did not match into another fellowship of interest (4.7%), and excellent job opportunity after graduation (4.7%) (Table 2). 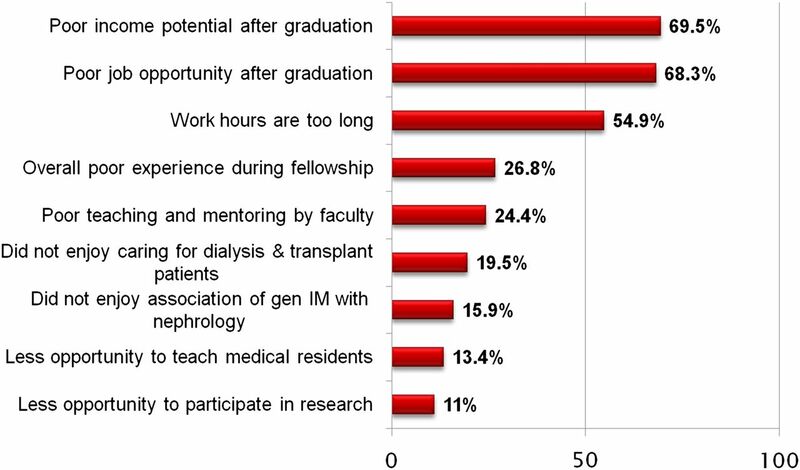 Subject material and mentorship were also the two important reasons for pursuing a career in nephrology on a 2009 fellow survey reported by Parker et al. (7). These findings suggest that the major factors influencing the decision to pursue a career in nephrology are finding the specialty to be interesting at the medical school and residency levels, positive mentoring experiences, and the strong integration of nephrology with general internal medicine. An important question is how career choice in nephrology compares with other fields. Data are limited in terms of direct comparisons among various internal medicine subspecialties, but there are several studies that have provided important insights. West et al. carried out a survey of postgraduate year 3 residents in which they rated the importance of several variables in their career choices. For nephrology, time with family, desire to provide a needed service, long-term relationships with patients, job opportunities after training, and having a mentor in that specialty ranked higher, whereas type/number of procedures and financial considerations ranked lower (8). A study from Canada by Horn et al. showed that internal medicine residents select careers based on intellectual interest and their personality type but that lifestyle issues and the experiences that residents have with mentors in that field are important as well (9). Kolasinski et al. examined the choice of rheumatology as a career and found their clinical experiences and the mentorship that they received to be important in affecting their choices (10). Similarly a study from Canada by Zborovski et al. also showed that for rheumatology, clinical experiences in the field and the mentors that they worked with affected their decision to pursue rheumatology (11). A study from the United Kingdom examining geriatric medicine as a career choice similarly showed that clinical experiences in the field and the mentors with whom they interacted favorably influenced the choice to pursue a career in geriatrics (12). Much can also be learned by examining factors that negatively influence career choice for other specialties as well. In pulmonary and critical care medicine, Lorin et al. found substantial concerns among internal medicine residents about a career in this field, with high demands in terms of responsibility and time, perceived stress among faculty, and the challenges of caring for chronically ill patients making them less likely to choose this career (13). Knowledge of such factors based on these studies and our own work might be of assistance to nephrology faculty in helping trainees in their career choices and in helping develop strong clinical and mentoring experiences. Are Nephrology Fellows Satisfied with Their Career Choice? Although it is of course our hope that all fellows will be highly satisfied with having chosen nephrology as a career, we do not know with certainty that they are. In addition to how unfortunate it would be to have physicians practicing in a field that they are dissatisfied with, there are additional implications of vast potential importance. Negative interactions of students and residents with nephrology fellows or nephrologists who are dissatisfied with their career choice might discourage many from pursuing a nephrology career. On the other hand, positive interactions with highly satisfied fellows who are advocates for their discipline will encourage interest in nephrology careers. Given the great importance of this issue, we addressed career satisfaction in our survey as well. Among graduating nephrology fellows who took the survey, 29.2% were extremely satisfied and another 25% were very satisfied with their career choice, 29.2% of them were somewhat satisfied, and 6.2% were slightly satisfied, whereas 10.4% were not at all satisfied with their career choice (Figure 1). Among nongraduating nephrology fellows who took the survey, 24.2% were extremely satisfied and another 34.3% were very satisfied with their career choice, 25.3% of them were somewhat satisfied, and 7.1% were slightly satisfied, whereas 9.1% were not at all satisfied with their career choice (Figure 1). A comparison of USMGs and international medical graduates (IMGs) is provided in Table 3. Nephrology was not the first choice for 11% of USMGs. However, among IMGs, the percentage for whom nephrology was not the first choice was more than double that at 23%. A greater percentage of fellows were extremely and very satisfied in the USMG group compared with those in the IMG group. It seems that if USMGs chose nephrology, they were more likely to be satisfied compared with IMGs. We carried out additional analyses to further examine the potential role of whether nephrology was the first choice and subsequent career satisfaction. First, we divided the group by whether nephrology was their first choice and then looked at the satisfaction breakdown using the five categories in our survey. Fellows for whom nephrology was their first choice reported higher levels of satisfaction compared with those for whom it was not (Table 4). We also did another analysis and looked at the proportions of fellows for whom nephrology was the first choice or not at each level of satisfaction. To note, approximately 91% of fellows in the extremely satisfied group had chosen nephrology first, whereas only about 64% had chosen nephrology first in the group that was not at all satisfied (Table 5). These findings suggest that having nephrology as a second or lower choice for a career may be a risk factor for career dissatisfaction. Career choice satisfaction among US adult nephrology fellows. Data are given in percentages. What Are the Factors that Contribute to Nephrology Career Satisfaction? In our survey, the top four reasons why fellows were extremely or very satisfied with their career choice included the following: excellent teaching and mentoring by faculty during fellowship training (78%), saw variety of cases that were “stimulating” (75.2%), enjoy intensive care unit nephrology (68.8%), and enjoy association of general internal medicine with nephrology (68.8%) (Figure 2). The other reasons included the following: enjoy CKD care (55%), enjoy dialysis and transplant patient care (51.4%), overall excellent experience during fellowship (45.9%), more opportunity to teach medical residents and students (45%), and more opportunity to participate in research and scholarly activities (30.3%). Least common reasons why fellows were highly satisfied with their career choice included the following: excellent income potential after graduation (19.3%) and excellent job opportunities after graduation (13.8%). These findings among highly satisfied fellows suggest that it is mainly factors related to the clinical and academic activities of being a nephrologist that are the main determinants of satisfaction, with income and job opportunities playing less of a role. Reasons why US adult nephrology fellows were “extremely or very satisfied” with their career choice. ICU, intensive care unit; gen IM, general internal medicine. What Are the Reasons for Less Satisfaction or Dissatisfaction with Nephrology as a Career? As shown in Figure 1, 27.3% of all fellows reported being somewhat satisfied, 6.7% slightly satisfied, and 9.7% not at all satisfied with their career choice. If these findings are representative of all nephrologists, it would suggest that there is substantial dissatisfaction with a career in nephrology, with nearly 10% being highly dissatisfied. The three top reasons why fellows were somewhat, slightly, or not at all satisfied with their career choice included the following: poor income potential after graduation (69.5%), poor job opportunities after graduation (68.3%), and long work hours (54.9%) (Figure 3). The other reasons for dissatisfaction with their career choice included the following: overall poor experience during fellowship training (26.8%), poor teaching and mentoring by faculty during fellowship (24.4%), did not enjoy caring for dialysis and transplant patients (19.5%), and did not enjoy the close association with general internal medicine (15.9%). The least common reasons for less satisfaction or dissatisfaction with their career choice included the following: less opportunity to teach medical residents and students (13.4%) and less opportunity to participate in research and scholarly activities (11%). To note, nearly two-thirds of all fellows surveyed were either US citizens or green card holders. This suggests that visa issues were unlikely to be a major factor in reduced career satisfaction in our survey population. Reasons why US adult nephrology fellows were “somewhat, slightly, or not at all satisfied” with their career choice. gen IM, general internal medicine. It is noteworthy that the findings of Lane and Brown regarding the reasons that trainees choose not to pursue nephrology reveal a number of factors similar to those that seem to contribute to career choice dissatisfaction for fellows (4). Several concerning blog postings of physicians in training, including nephrology fellows, were recently published in a public policy article by Parker et al. (1). Although few, these published blog postings confirm that dissatisfaction regarding career choice does exist among nephrology fellows. Despite projections of a growing demand for nephrologists, fellows reported poor job opportunities after graduation. We conducted the Life after Renal Fellowship survey in May and June of 2010 (14). The main purpose of the survey was to see if US graduating nephrology fellows had a job secured at the end of their fellowship training. Unfortunately, nearly one-third of the fellows who took the survey did not have a job secured at the time they took the survey. Surprisingly, 12% of fellows who had a job secured at the end of their fellowship would work as a hospitalist, with no nephrology practice, for the first year after graduation, whereas another 4% of the fellows would work as a combined hospitalist-nephrologist. Similarly, an article in Renal Business Today reported a phone-based survey in which 104 of the 324 graduating fellows indicated that they did not have a job secured as of May 2010 (15). The other question we asked on the Life after Renal Fellowship survey was if graduating fellows were glad that they chose nephrology as a career. Although the majority of the fellows were glad with their career choice, nearly one of five fellows taking the survey reported that they were not glad that they chose nephrology. For this group of dissatisfied fellows, not securing a job at the end of their fellowship can understandably be an important reason for them to be dissatisfied with their career choice. There are several potential explanations for fellows reporting difficulty obtaining positions. One explanation could be that the estimates of demand are incorrect and in fact that there is not strong demand for nephrologists at this time. A second potential explanation may relate to where in the country demand is highest. As is the case for most medical specialties, there is often substantial variability in job opportunities throughout the country and certain parts of the country tend to have greater difficulty retaining and recruiting physicians to work there. Many areas have the opposite situation and have a high density of physicians with opportunities for new physicians being sparse or offering income that is at a less desirable level. It is plausible that some of the fellows reporting difficulty obtaining positions might have been more successful if they were able and willing to seek job opportunities in other areas. Unfortunately, the data reported here as well as the data reported in the nature of the Life after Renal Fellowship survey noted above did not include an analysis of the geographical areas where fellows were pursuing positions and this question cannot be answered at this time. Additional factors that may be limiting fellows’ potential job opportunities include the general state of the economy and delayed retirement of practicing nephrologists. Although poor income potential and long work hours are cited by fellows as a source of dissatisfaction, this perception is not consistently supported by recent published data on physician incomes and work hours (16,17). There can be various interpretations of our survey findings. One is that although income potential and job opportunities do not seem to be important factors in the choice of nephrology, they seem to be major contributors to career dissatisfaction. It also seems that although the intellectual content of nephrology, its clinical activities, and favorable interactions with nephrology clinical educators and mentors help influence students and trainees to choose nephrology, poor experiences at the fellowship level may contribute to subsequent career dissatisfaction. Although it is plausible that dissatisfaction at the fellowship level may extend to the practitioner level, this will require further study. We also acknowledge that there may be limitations to the data we have collected. Our sample of 204 of the 892 trainees enrolled in nephrology fellowship training programs might not have been representative of the group as a whole. One characteristic of concern is the response rate from USMGs compared with IMGs. Thirty-eight percent of our survey respondents were USMGs compared with 40% of nephrology trainees (36% from US Liaison Committee on Medical Education–accredited medical schools and 4% from osteopathic schools) according to the Accreditation Council for Graduate Medical Education Data Resource Book for the 2010–2011 academic year (http://www.acgme.org/acwebsite/databook/dat_index.asp). Having program directors distribute the survey information to their fellows may have resulted in some fellows feeling obligated to participate in the survey process. It is also plausible that fellows who were more dissatisfied with their choice of nephrology might have been more motivated to respond to our survey, for example. We nevertheless feel that even if this were the case, the insights into the reasons for career dissatisfaction that this group can provide are invaluable if we are to improve career satisfaction. What Do We Know from Other Internal Medicine Subspecialties Regarding Career Satisfaction in Comparison with Nephrology? There are some data from other specialties that may provide additional insights into nephrology career satisfaction. Kaminetzky et al. recently published a study that involved surveying internal medicine subspecialty fellows who had rotated through Veterans Affairs (VA) medical centers (18). This survey assessed fellows’ training experiences at the VA from an overall perspective as well as using variables that were categorized within six different areas. Personal experiences with subspecialty patient care and interactions with clinical faculty and preceptors contributed most strongly to the overall level of satisfaction (18). These findings seem comparable with our findings of factors contributing to career satisfaction with nephrology. However, also noteworthy in this study is that compared with overall satisfaction scores for other specialties, nephrology ranked sixth of the nine specialties studied (18). This study did not include a comparison with the field of general internal medicine/primary care, a comparison that may be important given that career satisfaction seems to be higher with subspecialties compared with primary care (19). Leigh et al. also reported on career satisfaction in various fields, including noninternal medicine fields, and found that nephrology was one of four specialties (with the others being pulmonary/critical care medicine, neurologic surgery, and obstetrics and gynecology) that had significantly lower satisfaction scores compared with family medicine (20). Although these data are limited, they support the idea that the experiences that trainees have and the interactions with faculty that they have play a role in their career satisfaction and that overall satisfaction with nephrology may be low compared with other specialties. What Can Be Done to Promote Interest in Nephrology and Career Satisfaction? Several measures can be considered by the nephrology training community to promote interest and to ensure a higher level of satisfaction among US nephrology fellows. Career satisfaction can in part be enhanced by making sure our graduates are properly trained for all of the activities that their careers entail. Having detailed knowledge of all of the aspects of what practicing nephrologists do and making sure that training programs are structured to help trainees develop the necessary competencies is extremely important (21). Berns reported the results of a survey that revealed that there are several areas in which practicing nephrologists felt they have received inadequate preparation during fellowship training (22,23). This information can be of great assistance to programs in restructuring their curricula. At our institution we have taken great interest in the recommendations of the ASN Task Force (1) and have restructured both our nephrology curriculum and elective experiences for all medical trainees, hoping to provide them with a richer educational experience and to help them develop, enhance, and maintain interest in nephrology (24). One approach to promoting interest in nephrology might be to provide a more representative experience in nephrology to both medical students and residents during their elective time. The restructured elective we developed includes both an inpatient consultative and extensive outpatient experience. During the outpatient experience, medical trainees get to experience various renal clinics, including CKD, hypertension, peritoneal dialysis, and kidney transplant clinics. In addition, they round with faculty members in outpatient hemodialysis several times during the elective. They also get to meet and discuss basic and clinical research with faculty members. We are hopeful that this extensive experience will provide the medical trainee with a much more realistic insight into the professional life of a nephrologist and a long-lasting interest in the field. Another approach to fostering interest in nephrology may be by using alternative teaching approaches (25–31), incorporating newer methods and styles that are well adapted to today’s learner. The use of current web-based learning tools such as blogs, wikis, podcasts, and other social media must be strongly considered during fellowship training (32–37). These teaching tools may not only increase interest in nephrology, but may also enhance and maintain interest during nephrology fellowship. In addition, our survey suggests that it is also essential to continue to provide strong mentoring as well as teaching during fellowship. Enhancing these skills may require substantial investment in faculty development programs. Fortunately, there are data available that have provided substantial insights into the qualities of excellent mentors that can be useful in nephrology training programs. For example, Cho et al. took a novel approach to studying the qualities of outstanding mentors by reviewing the nominating letters of 29 faculty members at the University of California, San Francisco who were being nominated for the Lifetime Achievement in Mentorship Award (38). These authors found several key qualities that emerged, including their having outstanding personal qualities and devoting ample time, providing specific career advice to the mentee, and serving as excellent role models with high standards and expectations. Awarding excellent and committed nephrology clinical educators and mentors should also be considered. It is hoped that as a result of some or all of these interventions and others, training programs and ASN can help promote greater interest in nephrology and career satisfaction with this choice. As part of taking actions that will hopefully promote interest in nephrology and career satisfaction, it will be important to continue to gain insights into the educational experiences of students and postgraduate trainees and to measure the success of various interventions via various outcomes (39). Surveys are one method to accomplish this; for example, we have been conducting surveys among trainees in addition to the one reported here that cover areas such as the job search process for nephrology fellows and the perceptions of nephrology by non-nephrology fellows (14,40,41). Interest in nephrology seems to be declining, especially among USMGs, and there appears to be a degree of dissatisfaction with careers in nephrology that requires the nephrology community’s attention. The decision to pursue nephrology is influenced by several factors, including the experiences that students and residents have with practicing nephrologists and fellows. By providing students and residents with a strong and innovative educational experience with positive mentoring in nephrology, not only in terms of didactics but in terms of what nephrologists do in their careers, it is hoped that we can encourage more trainees to consider this career pathway and help ensure that those who make this choice are happy with it throughout their careers. We gratefully acknowledge the nephrology training program directors throughout the United States to whom we are indebted for their assistance in carrying out this study. We also gratefully acknowledge our fellow Dr. Prasanth Krish for his assistance in conducting the survey. Results of this study were presented at ASN Kidney Week 2011, November 8–13, 2011, Philadelphia, Pennsylvania. See related editorial, “Attracting More Residents into Nephrology,” on pages 1382–1384.